Ronan = 4 / 10. Charles Lee ex-girlfriend manages to steal the remaining of Chucky and brings back to life the soul of her beloved inside of the killing doll. This fourth sequel of the Chucky series is the one that introduce of the most important character of the franchise: Jennifer Tilly (here as Tiffany). This may be the one of the best aspect of the movie which, other than that, is often considered as one of the worst of the series. 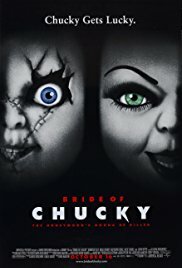 Indeed, the concept of the killing doll start to be quite overused by now, and bringing a girlfriend to Chucky not only is difficult to justify, resulting in a rather far-fetched story. Unfortunately, bringing Chucky a girlfriend only barely compensate for the repetitive story, and it seems that every Child’s Play movie revolve around the same concept: a poor innocent(s) is accused for Chucky murders because no-one believe a doll can kill. This said, Bride of Chucky remains an interesting one for those (like me) who are quite found of the franchise. It is the sequel that marks the transformation from a slasher to a comedy-oriented movie, something that fits quite well with the Child’s Play atmosphere (I’m a big fan of “Seed of Chucky”). 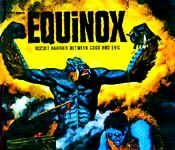 A more than watchable sequel!